I might have mentioned in a previous blog that I had been working on some of my own quilts after the graduation t-shirt quilt rush had passed. Actually, that wasn’t quite true. I have a niece who is living in a long-term rehab facility with about a dozen other women. My mother pieced a quilt and I quilted it on my longarm quilting machine and we sent it to her. The other women “oohed and aahed” over my niece’s quilt and as she said, they were experiencing a little quilt envy. Well, that just wouldn’t do. My sister and I decided that we would make quilts for all of them. My mother and a friend also provided some quilt tops as well and my friend also provided a completed quilt. So I have been busy piecing, quilting and binding quilts for my niece’s housemates. I just finished up today and they will be delivered this weekend. We have enough quilts for all the residents along with two or three extra for new residents that come in. We will continue providing them, but we won’t have to do so many at one time in the future. 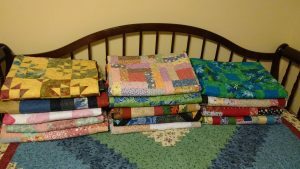 I don’t think we will be allowed to take photos of the women with their quilts, so I stacked them up and took a picture so I could share them on my blog. It has been so much fun making these quilts and I hope they will bring comfort to these ladies who don’t all have the family support that my niece has. Now it’s time for me to get back to making t-shirt quilts, memory quilts and baby clothes quilts for customers. Be sure to contact me soon if you would like a quilt to send to college with your son or daughter.